My friend was surprised when I told him I find cooking very relaxing and therapeutic. How can getting out pots and pans, chopping and grinding, sautéing and stirring be considered therapeutic, especially when you have to not only cook, but also wash, wipe and put them away was his question. Well, cooking becomes just a task or chore when you think it that way. For me cooking is more than day to day chore. While I find chopping vegetables and fresh herbs quite relaxing, the heady aroma of roasted spices makes me slow down and enjoy little pleasure of life has to offer. The steam coming out of pots and pans gives me free facials every day and the flexibility of adding or substituting any ingredients of my choice gives me a sense of freedom. The colour of various fresh leafy, green, yellow, red, orange and multi-colored fruits and vegetables fascinates me and makes me happy. The process of transforming raw, solitary ingredients into a savoury amalgamation of flavour, taste, smell, texture and colour is always magical. And the ultimate pleasure is when you are rewarded by ohh’s and ahh’s, great positive feedback from the people you love busily licking the food you cooked. This kind of therapy is priceless, fun and also delicious! Well, not every task or chore gives you this kind of pleasure. Do you think I am right? What makes you relax and enjoy? These days I am having real rough time at office. With project deadlines to meet I feel emotionally drained and exhausted by the time I reach home. I find solace in my kitchen with my HD next to me. By the time we finished cooking our dinner I was calm and relaxed and enjoying the moment. Food cooked was simple; Gujarati Methi Thepla served with bowl of cool yogurt, super hot mango pickle and shallots. Simple task as picking the leaves from big bunch of fresh methi/fenugreek leaves can be therapeutic and cheer you up and punching and rolling of dough can take away all the frustration and leave you content. Now that’s something I prefer rather than sitting in one dark corner and sulking!!! 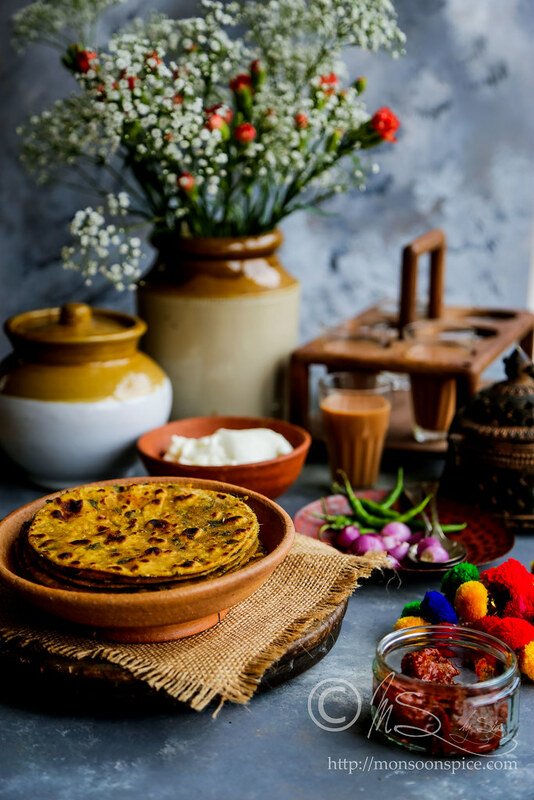 Here is the recipe for simple Guajarati flat bread called Methi Thepla which is one full meal by itself. 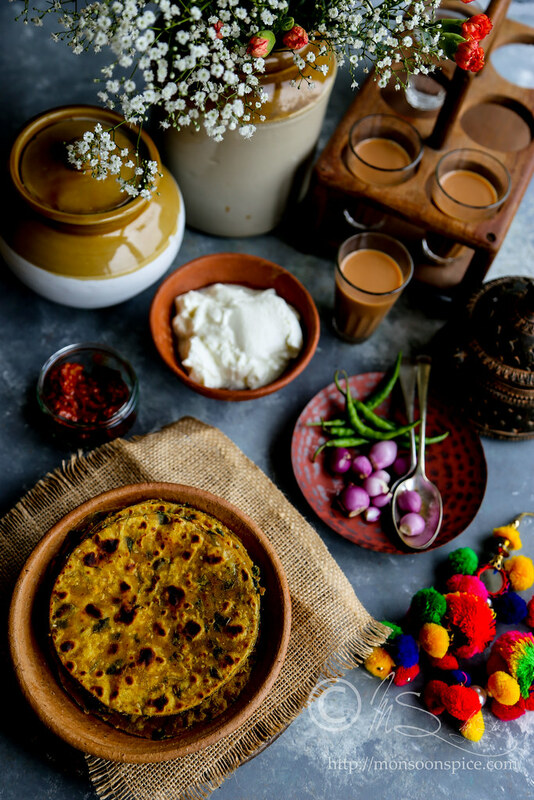 Methi Thepla, a multigrain flatbread flavoured with fresh fenugreek leaves and spices. 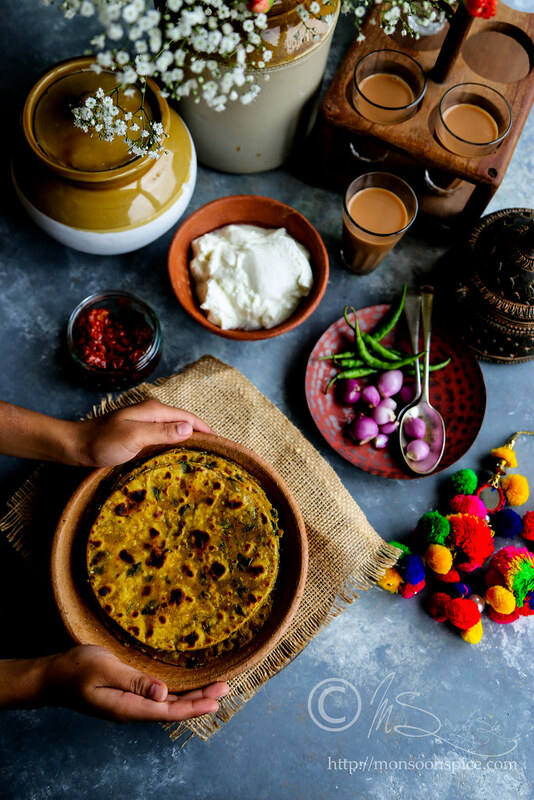 Packed with amazing flavour and nutrition, this is one dish I can eat for breakfast, lunch, dinner and as in between snack :) You can serve it on its own or accompanied with just pickle or yogurt and hence without any doubt it serves as an excellent travel food. 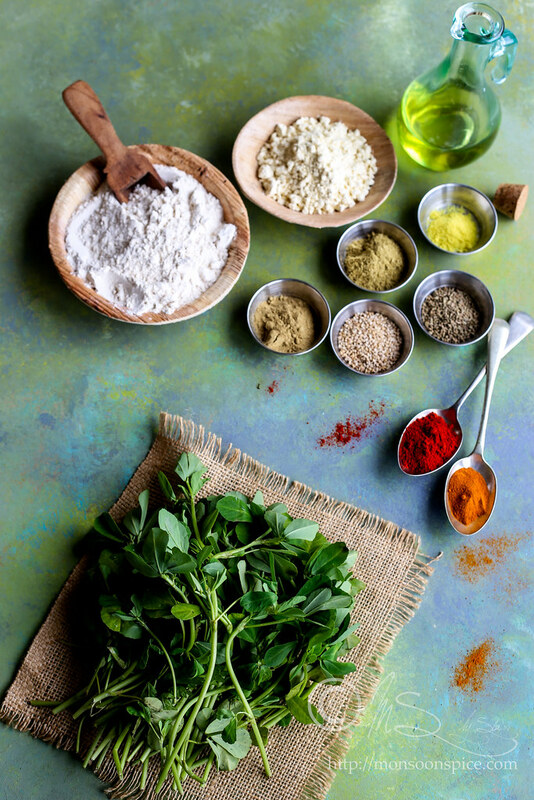 Methi or fenugreek leaves have high iron and minerals contents and their bitter taste mellows as the flatbread is cooked making it one of kid friendly recipes. Along with whole wheat flour and gram flour, you can add other flours like bajra (pearl millet flour), jowar (sorghum), ragi (finger millet) or any other flour of your choice for added nutrition. To save time, you can pick the methi leaves and store them in an air tight container or zip lock bag and pop in the fridge for 4-5 days. Wash them before using them in any recipe. You can also wash them and store it in a freezer for up to 1 month and use them in the recipe. If you don’t have fresh methi or fenugreek leaves, you can use some finely chopped fresh coriander leaves and about 2 tbsp dried fenugreek leaves (kasuri methi) and follow the recipe. 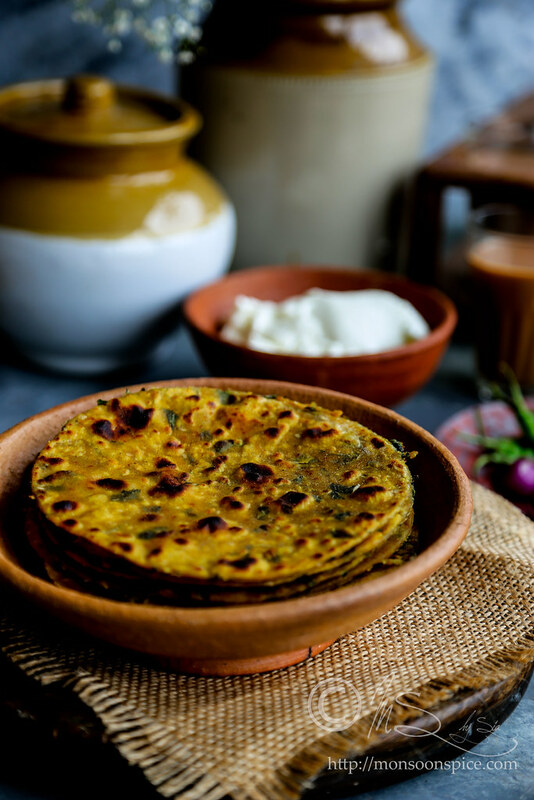 These Methi Theplas remain fresh for 4-5 days at room temperature, making them perfect dish to pack for long distance trips and travels. For longer shelf life, store them in refrigerator an air tight container for up to 7 days and pack them in an zip lock bag in between a parchment sheet and store in freezer for 1-2 months. Reheat the Methi Theplas in hot griddle and brush them with little oil or ghee before serving. 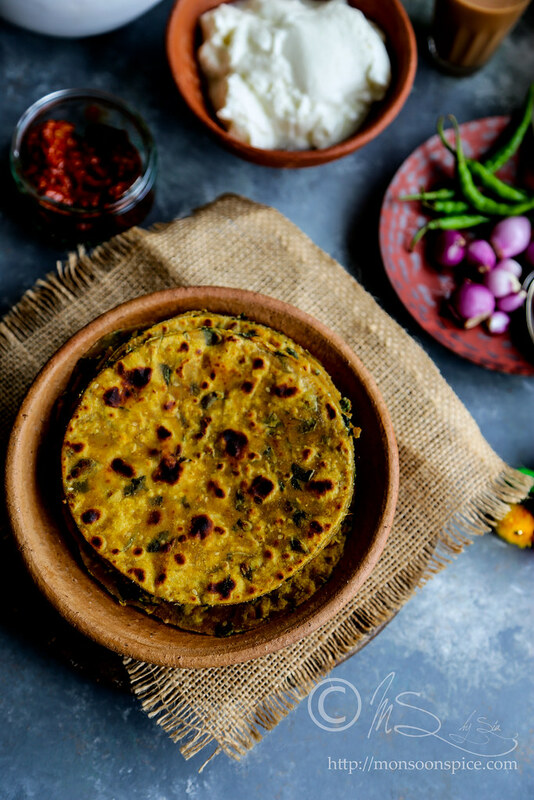 So without further ado, let’s get cooking some delicious Gujarati Methi Thepla that packs flavour and also a nutritional powerhouse. Pick just the leaves from a bunch of methi/fenugreek leaves and wash them thoroughly. Roughly chop them and place them in a large mixing bowl. Crush the finely chopped ginger and green chillies with a generous pinch of sea salt into paste in a blender or pestle and mortar. Add this to the mixing bowl. Tip in all the ingredients listed above (wheat flour, gram flour, millet flour, sesame seeds, salt and all the ground spices) and mix them well. Pour oil, yogurt if using and about 2-3 tbsp of water and start mixing them to form a dough by adding little water at a time. Remember that the fenugreek leaves will release water as you mix and knead and hence take care not to add too much water. Cover the bowl with kitchen towel and let it rest covered for at least 30 minutes. Heat the griddle or tawa on medium flame. While the griddle is heating, knead the dough again for a minute and pinch large lime sized balls. Roll the balls on wheat flour covering it well and press it down with hand. 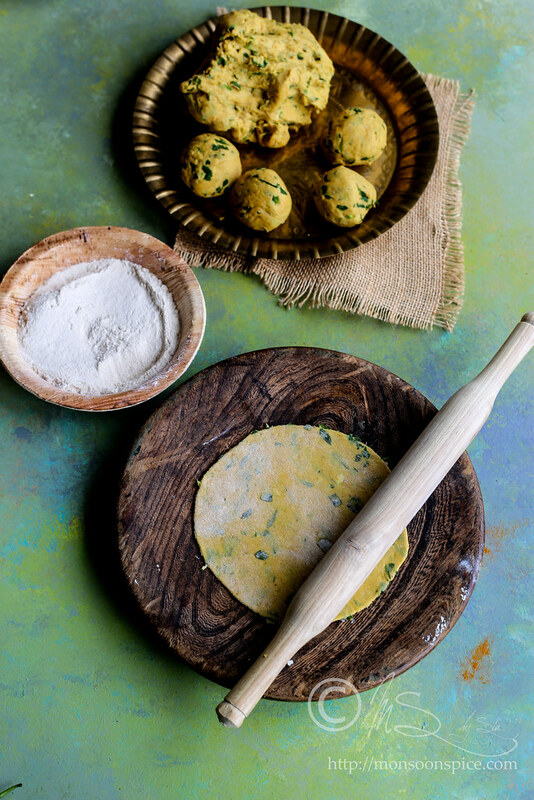 With the help of a rolling pin, roll it into circle to form thin roti. Dust off the excess flour. Place the roti on hot griddle and cook on medium to low heat for half a minute and flip it. Brush the roti with some ghee or oil and flip it again. Brush the oil or ghee on other side and cook until both the sides are cooked well and few brown spots start to appear. Repeat and cook all the Theplas and place them covered in a casserole dish until ready to serve. 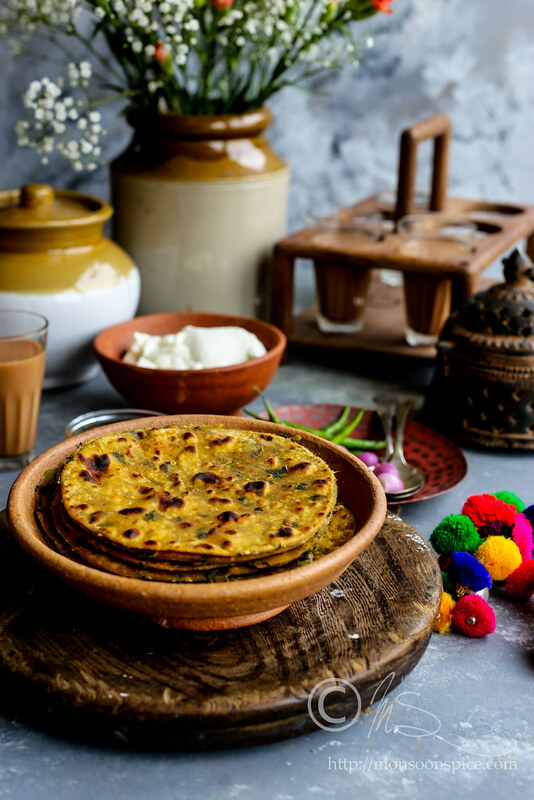 Serve these delicious Gujati Methi Thepla hot with chilled yogurt and/or pickle or with a curry of your choice and enjoy. Along with whole wheat flour and gram flour, you can add other flours like bajra (pearl millet flour), jowar (sorghum), ragi (finger millet) or any other flour of your choice for added nutrition. To save time, you can pick the methi leaves and store them in an air tight container or zip lock bag and pop in the fridge for 4-5 days. Wash them before using them in any recipe. You can also wash them and store it in a freezer for up to 1 month and use them in the recipe. If you don’t have fresh methi or fenugreek leaves, you can use some finely chopped fresh coriander leaves and about 2 tbsp dried fenugreek leaves (kasuri methi) and follow the recipe. These Methi Theplas remain fresh for 4-5 days at room temperature, making them perfect dish to pack for long distance trips and travels. For longer shelf life, store them in refrigerator an air tight container for up to 7 days and pack them in an zip lock bag in between a parchment sheet and store in freezer for 1-2 months. Reheat the Gujarti Methi Theplas in hot griddle and brush them with little oil or ghee before serving. Wow....this looks yummy and perfect! Sia, you said it so well. That is exactly the look people give me too. Look at those perfectly shaped Methi theplas, you are an expert now. That looks wonderful Sia!...nice and lovely ! For me cooking is relaxing and therapeutic and love when my family enjoy the food i have made for them. Kitchen is the only place where u can do anything with freedom, no rule, act instantly, make ur choice... U r right Sia in another word "free Therapy". 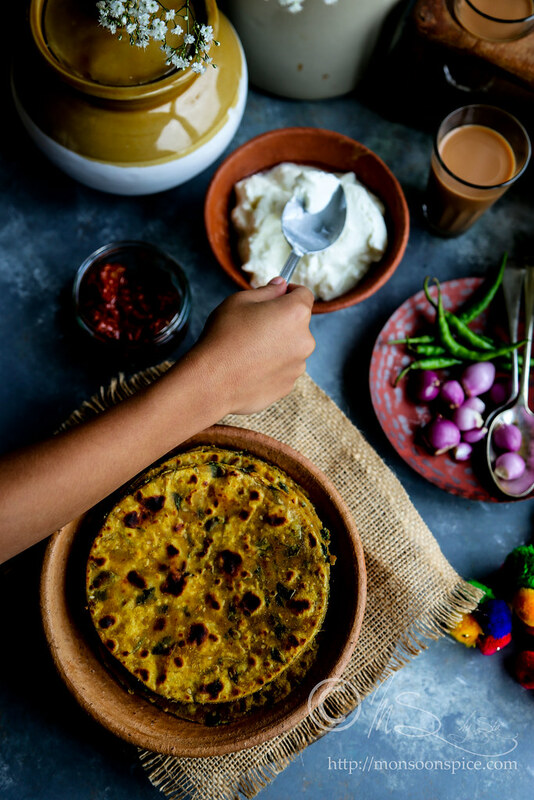 wow, you say simple dinner, but these methi thelpas look like a heavenly dinner. Wonderful presentation as usual. They look so delicious. i agree with your friend. i don't find cooking therapeutic. let me rephrase that. i like to cook only if someone else chops, does all the prep work, washes and cleans. and takes the pics for the blog. then, yes, it's theapeutic. especially when you're eating. Methi thepla look so good. Lovely picture as usual. YUM!... really so tempting. Theplas look delicious, Sup! Though I love cooking, I don't really enjoy cooking everyday, especially not complicated dishes. I think it's more because I have so much to do after I get home that cooking becomes just one more thing to take care of, sadly. If I had a sous chef to do the chopping & grinding and other "suttu kelasa" as my mom calls it, I would cook happily, I think! :) I do have a friend though, who WANTS to cook after a long day at work as he finds that relaxing! Cooking is therapeutic only if you enjoy doing it. For people who *think they cannot cook, it is scary. And add fast food/take-outs to that. Hi Sia, You are so right about cooking being therapeutic. I will cook up a storm when I am frustrated or angry too. Theplas with chunda is my fav combo. That looks yum!! ESp with a side of mango slices. and yeah cooking is such a therapy for me too..I actually feel relaxed and content after preparing a meal!.. 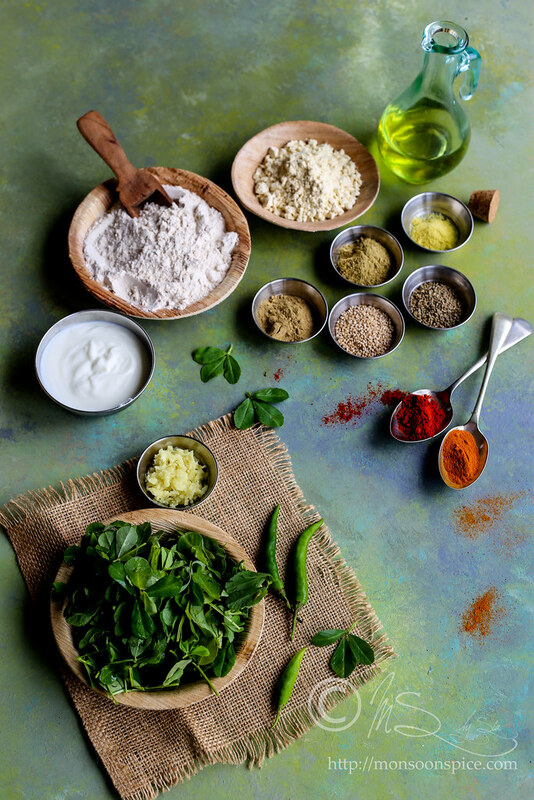 Isn't is wonderful that cooking can help you unwind after a hectic day? I know exactly what you mean. When you're cooking, you get so focussed on what you're doing that you forget all about what was bothering you! Thanks for the delicious submission, Sia! 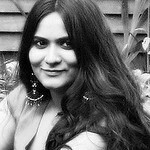 Hi siya, Visiting ur blog for the first time.Ur Having a wonderful and lovely blog. Methi thepla Looks yummy and perfect. Sia, those look lovely. First time visiting your blog and I love your layout! Very very well done! I've said this in Sig's blog but will say it in yours anyway - I used to find cooking therapeutic, the longer the recipe, the better, but with a rushed schedule now, it's almost a chore. Not the blog, though, heh heh! I love methi thepla, looks perfect and lovely presentation sia. always great with pickle and with bataka nu shaak. thanks for delicious entry..of methi thepla..for the event..
Baking for me is therapeutic..Kneading the dough for bread is my stress buster.. Very nice.. thanks for the recipe.. Tried it and it was lovely.. These flatbreads sound delicious. I enjoy baking very much and once said to someone that I liked the process of baking as much as the actual eating. She gave me a look that clearly said she thought I was odd! i share exact emotions as you when it comes to cooking. so much joy! Hi, saya dari indonesia, senang berkunjung diblog anda salam dari saya.